Cesare Cesariano, detail of a table with the cross-section of the Duomo, Milan, by Di Lucio Vitruvio Pollione De Architectura Libri Dece 1521. ‘Rigenerazione e sviluppo di un ecosistema metropolitano’ (Regeneration and development of a metropolitan ecosystem) is the title of the third edition of the Construction Conference recently held in Padua on the construction supply chain in which companies, the design world and customers discuss the most important questions connected to the transformation of the sector with the institutions. We interviewed Giovanni Battista Furlan, who was a speaker on these topics as Chairman of the NET Engineering International group and Deputy Chairman of OICE. What are the fundamental elements of the project contributing to the creation of a public work able to become a legacy of value for future generations? To answer this question, we have to look back not centuries but thousands of years to Vitruvius who, around 15 BC in his treaty ‘De Architectura’, codified the three fundamental principles that every building should aspire to – Utilitas (function), Venustas (beauty) and Firmitas (solidity). It seems that, in recent decades, modern designers have forgotten these. On Utilitas, or the lack of it, I immediately recall a video that went viral a few years ago showing some boys playing football on a deserted motorway. The video highlights the paradox of an infrastructure built without thoroughly checking the real needs it was to satisfy. We can soon deal with Venustas. There are many specimens, for example, of ‘eco-monsters’ that have defaced, often irreversibly, the Italian coastline. For Firmitas, the tragic images of the collapse of the bridge in Genoa are still in the eyes and hearts of everyone, a sadly emblematic case of the atavistic lack of maintenance and monitoring of infrastructure. Is it really still possible to refer to design standards dating back more than 2,000 years ago? We have to consider that the principles of Vitruvius‘s triad are a necessary pre-condition but aren’t enough to design and build works of value. One of the elements that should be added to the base of the classic triangle is the consensus of the stakeholders. There must be a radical change of paradigm – the contemporary designer must leave the ‘ivory tower’ where they’ve always lived, a convinced holder of the ‘absolute truth’, and accept observations and criticisms. Consensus must be acquired along the way, with patience and humility, through Public Discussion, avoiding falling into the so-called Decide, Announce and Defend syndrome and, instead, adopting the Propose, Listen, Discuss and Decide method. The involvement of all the stakeholders must lead to a sort of co-design of the work, where all those involved for whatever reason can see the fulfilment of their contribution. Another essential element which, if missing, may compromise the balance of the whole scheme is the economic, social and environmental sustainability. No work should be created without the appropriate sustainability guarantees to protect future generations. So what tools can we use to ascertain the validity of a project from the point of view of sustainability and responsibility towards the new generations? for newly-designed works, the new Italian Law on Tenders has introduced a vitally important tool, the Feasibility Project. No longer just a ‘Study’, the Feasibility Project sums up all the features that were previously in the two steps of the Feasibility Study and Preliminary Design, providing for further investigation and quantitative analysis from the very start of the design. 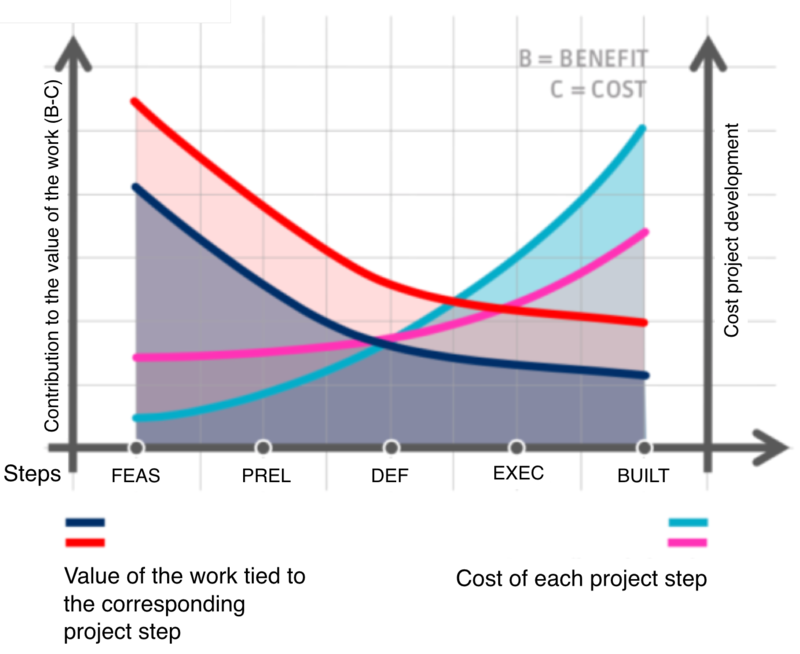 An interesting graph presenting the value curves of the different design steps shows us how greater investment in design investigations in the initial stages is desirable to obtain an increase in the final value of the work, even given the same total development costs of the project. for works already designed, and possibly started but at a stage where appropriate amendments can still be made, there is the Project Review, which consists of the application of objective assessment criteria to obsolete projects designed decades ago which never underwent a feasibility check in the initial stage, with the aim of taking the work back to its basic features. Current technological progress, both in the materials field and that of construction techniques, is able to limit construction costs, eliminating the useless excesses of the project following a lean design approach. It should also be stressed that the Vitruvian standard of Firmitas, can now no longer be interpreted as solidity and stability over time. For this, every work must be designed structurally and in a native manner for easy maintenance, even at the cost of higher initial charges. Respect for Firmitas requires the preparation of a careful Maintenance Plan which sets out visual and instrumental continuous monitoring right from the start of the project. Therefore, to sum up, a modern, truly ‘Vitruvian’ public work could have a virtually eternal useful life, becoming a precious legacy to be handed down to the new generations and whose demolition/replacement can only be justified by an unexpected change of function. We no longer have any excuses – we have the most sophisticated instruments able to give the greatest support to maintenance and asset management (such as Building Information Modelling) and, as a result of the use of the most evolved program and project management techniques, quality public works, able to unite ancient principles and contemporary sensitivities, can be designed, constructed and maintained over time. Giovanni Battista Furlan is Chairman of NET Lab and NET Engineering International and Deputy Chairman of OICE.